Research suggests that the natural compounds in GABA Brain Food™ may help reduce temporary feelings of stress, as well as promote relaxation and improve sleep. This natural formula contains the necessary precursors and cofactors for optimal GABA availability. As the main inhibitory neurotransmitter in the brain, GABA’s role is to act like a “brake” and balance excessive stimulation. GABA is associated with normal restful sleep, relaxation, tranquil thoughts, and a serenity of mind. An amino acid found in foods like watermelon, dairy, beef and pork. L-citrulline is converted into L-arginine, a known nitric oxide booster, which is theorized to help shuttle GABA into the brain across the blood-brain barrier. Found in rosemary, sage, mint and basil, rosmarinic acid is a naturally occurring polyphenol flavonoid. It is also found in lemon balm and is used in aromatherapy to promote feelings of calm and relaxation. Similar to L-citrulline, grape seed extract is used to increase nitric oxide production to help GABA pass across the blood-brain barrier and enter the brain. Take a serving of 1 or 2 capsules as needed, or as directed by a healthcare practitioner. GABA is a neurotransmitter which acts like a “brake” to keep excitation in check. Too much excitation can lead to irritability, restlessness, and sleep disruption to name a few. GABA’s role as the main inhibitory neurotransmitter helps provide this function in the human body. GABA is what is known as a self-inhibiting compound. This means, when you take more GABA than your body needs, it blocks its own transport into the brain to maintain constant, normal GABA concentrations. To circumvent this mechanistic limitation, we included the ingredients L-Citrulline, Rosmarinic Acid, and Grape Seed Extract. These natural ingredients work synergistically to both increase GABA’s transport into the brain and work to sustain elevated concentrations of GABA. Click here to view a diagram of how GABA Brain Food’s ingredients influences natural GABA metabolism. The main challenge in increasing brain levels of GABA via supplementation is circumventing the molecule’s inherent self-inhibiting characteristic. It is suggested that increasing GABA’s permeability across the blood-brain barrier is an effective target to increase brain levels of GABA. One way to do this is to increase vasodilation by upregulating nitric oxide (NO) production in the body. 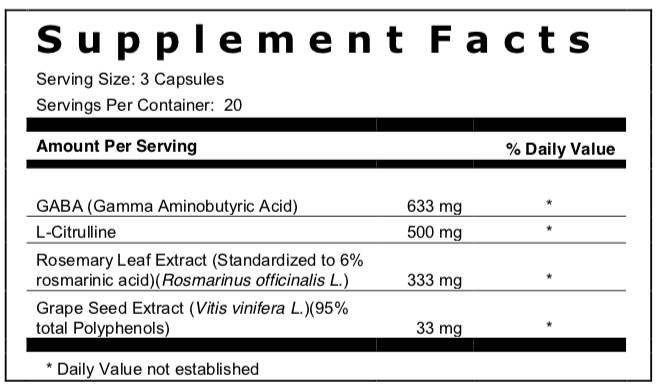 L-citrulline is a precursor to the amino acid, L-Arginine, which has a potent effect on stimulating NO production. Additionally, grape seed extract has been shown to increase the production of Endothelial Nitric Oxide Synthase (eNOS), an enzyme used to generate NO from L-Arginine. Once GABA is made more permeable and able to freely cross the blood-brain barrier with increased NO production, it is naturally broken down by the enzyme GABA-Transaminase (GABA-T). To attenuate the degradation of GABA by GABA-T we incorporated rosmarinic acid into our formulation, which has an inhibitory effect on GABA-T, thus allowing for sustained, elevated levels of GABA in the brain for a longer period of time. Designed to support the body's natural production of Serotonin, a neurotransmitter essential to mental well-being. 1. NIH. U.S. National Library of Medicine. GABA. Compound Summary for CID 5281792 Pub Chem. Open Chemistry Database. 7. Kuhn, K. P., et al. Oral citrulline effectively elevates plasma arginine levels for 24 hours in normal volunteers. Circulation 2002; 106: II1–766S. 8. Schwedhelm, E., et al. "Pharmacokinetic and pharmacodynamic properties of oral L-citrulline and L-arginine: impact on nitric oxide metabolism," British Journal of Clinical Pharmacology, 65(1):51-9, 2008. 9. Stephen J. Bailey, et. al. L-Citrulline supplementation improves O2 uptake kinetics and high-intensity exercise performance in humans. J Appl Physiol 119: 385–395, 2015.